Disasters can happen anywhere in the world and at any time, take the heaviness of the monsoon flooding season in India during 2013 which led to severe losses of human life and property. Unfortunately, many of those human losses could have been avoided. If individuals had been equipped with a simple communication system such as two way radios, people would have been able to coordinate between themselves quickly and those at most risk would have had a much greater chance of survival. This disaster event in India and others like it have sparked a realization worldwide that has led to the purchase of countless two-way radios. The sale of two-way radios continues to increase at an astonishing rate in the United States as well as throughout the rest of the world as people begin to realize just how important communication is in an emergency. It should be stated though, that the transition from toy walkie talkie to effective emergency communication tool owes much to the improvements in manufacturing and radio technology that have taken place over the last twenty or so years, thankfully these improvements have not pushed the price of even the best two-way radios too high for most people. Why do you need a two-way radio when you have your cell phone? Did you know that cell networks and landlines would very likely be useless in a SHTF type situation? That's why, as an alternative, two-way radios are perfect for ensuring that you have a way of communicating, at least at a local level, even if cellphone towers and internet access is impaired. As an affordable and accessible means of communication, two-way radios are considered to be extremely useful and practical. In an emergency, this is true perhaps more than in the case of any other type of radio, including efficient radio systems like CB or ham. Two-way radios will provide you with a fast and reliable way to track down friends and family helping you to find out exactly where everyone is in an emergency. This means that, even if there is a large flood or an earthquake, you will be able to either coordinate to join up with them, if that is possible, or at the very least make sure everyone is OK for the duration of the emergency. As mentioned previously, most two-way radios that are available for consumers are affordable, relatively speaking, and unless they exceed a certain power output they do not require any special license or permit to use. Many two-way radios are durable, easy to use, lightweight, energy-efficient, and are not reliable on external power, or connections to work. Quite a few modern two-way radios have been designed to float on water instead of sinking, and they also have numerous features that make them extremely practical, such as being able to avoid large energy usage thereby enabling them to continue working for days, if not weeks, on end. The most common complaint about two-way radios is that they don't even get close to the range advertised by their manufacturers. All manufactures now state that the ranges advertised are the optimum ranges for unobstructed distances over specific types of terrain and in perfect conditions, although I don't think many show this in big bold text! So to reiterate, the biggest disadvantage that two=way radios have over other forms of communication is that they work on a line of site basis. This means that if you were standing on a flat piece of land contacting someone who is also standing on that same flat piece of land, with no obstructions between you both, your signal would only carry for about 3 miles due to the curvature of the earth. If, however, you were stood on top of a mountain trying to contact the same person, again with no obstructions, your signal could carry up to 50 miles depending on the power output of your radio. In an urban situation with numerous obstructions your range will get absolutely hammered to the point where you may be lucky if you can get a mile range. In that case, it is always wise to look for higher ground for more effective use. Another disadvantage is the limited number of channels that many radios have. 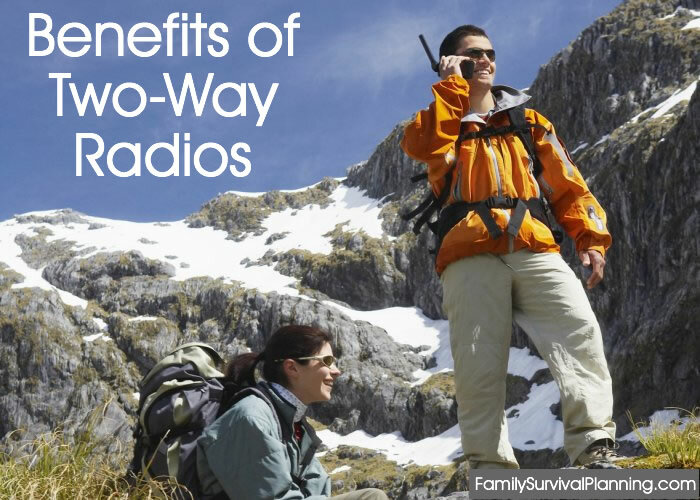 This may not seem like too big an issue at first, but when large numbers of people start using their two-way radios at the same time as you are using yours, as would be the case in a SHTF situation, it would be almost impossible to use your radios effectively. There's no denying the benefit of a good two-way radio in a SHTF-type emergency and beyond, and with radio technology the old adage is often true, you get what you pay for. More expensive models will inevitably be more powerful; which means they'll have a greater range and a stronger signal, they'll have a longer battery life, and they'll be built so much better. Danny Major is a former armored reconnaissance soldier who knows a thing or two about survival, keeping off the radar, and being prepared. You can read more about how zombies turned him into a bona-fide prepper by visiting his site AlphaSurvivalist. Choose the perfect two-way radios for your family here.